Improved scanning of disk images (.VHD, .VDI, and raw disk images). Better workflow for saving and restoring sessions when using Dig Deeper mode: the "Restore session" button now appears in the Advanced tab when selecting the types of files to recover. Once you select the session to restore, DiskDigger will resume scanning from where the session left off. Improved recovery logic for FAT32 and exFAT partitions when using Dig Deep mode. Improved user interface for right-to-left languages, such as Hebrew and Arabic. 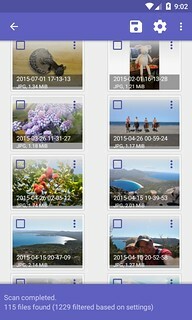 Download the new version and recover your lost files with ease. Improved detection of partitions on corrupted drives. Even if the partition table on your disk is corrupted or overwritten, DiskDigger will attempt to search for recoverable partitions independently of the partition table, and let you recover files from these lost partitions. 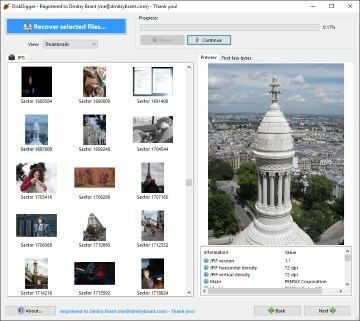 When recovering files in "Dig Deep" mode, you can now filter recoverable files by general file types, such as "Pictures", "Documents", "Presentations", etc. This will automatically show you only files of the selected type, and make it easier to find the file(s) you're looking for. 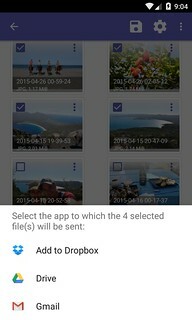 As before, you may also still apply a custom filter on the recoverable files, where you can search the files by name, size, and folder location. In "Dig Deep" mode, improved detection of whether or not a file is recoverable. DiskDigger provides hints of whether a file is recoverable by showing a red or green dot icon next to the file. 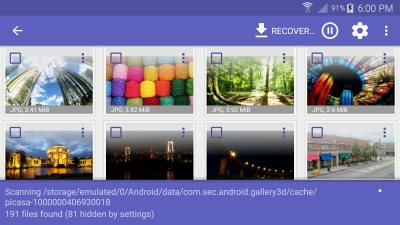 This functionality has been expanded and improved in this update, to give you more confidence of the recoverability of each file. Fixed possible issues when recovering files larger than 2 GB. On certain filesystems, recovering a very large file may have resulted in an empty file. This has been fixed. Improved compatibility with older versions of Android (all the way down to Android 2.3, Gingerbread). Improved messages and warnings when recovering large quantities of files. Support for recovering SQLite databases. This is usually the format used for storing SMS messages and contact information. Recovering deleted messages and contacts from these databases is not yet part of DiskDigger, but is planned for a future version. News for December 2016: a big update! 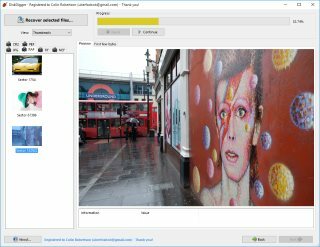 Today brings a very significant update to DiskDigger for Windows! The interface has been improved, with a stylish ribbon control that contains all the options and buttons you'll use for navigating and recovering your files. There are also improved "help" options every step of the way, with some of the most commonly-asked questions answered right inline. 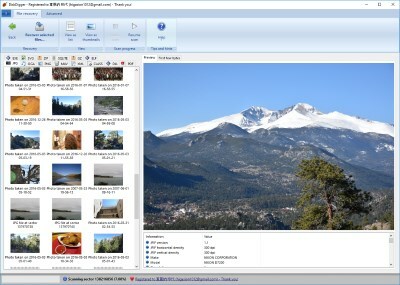 This update also has new features for advanced users and forensics specialists: the ability to save and restore "sessions" of data recovery (for scanning especially large drives over multiple sessions), as well as the ability to generate detailed reports of all the data that DiskDigger finds during a scan. Now using a Ribbon interface, which contains navigation (Back / Next) buttons, configuration settings, and recovery options. Every section of DiskDigger's workflow now has a "Help" button where you can find answers to common questions about the recovery process. 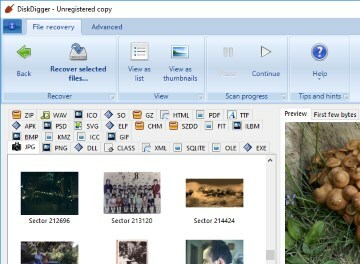 In "dig deeper" mode, recoverable files are named in a more friendly way. Instead of naming them "Sector 12345", DiskDigger will try to name them based on any metadata that it finds within the files. 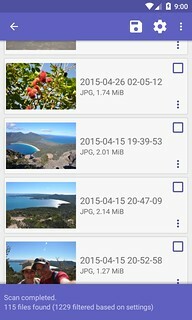 For example, if a recoverable .JPG file contains a date stamp, it will be named "Photo taken on 2016-12-15". 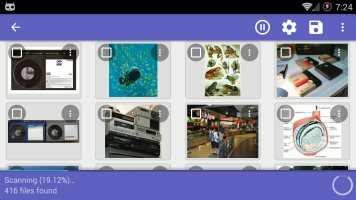 This will make it easier to sort through the list of recoverable files, and help you pinpoint the files you're looking for. In "dig deeper" mode, you can now save and restore sessions (in the Advanced tab). In both "deep" and "deeper" modes, you can now save a detailed report (in the Advanced tab) which is a log of all recoverable files found by DiskDigger, along with basic meta-information for each file. 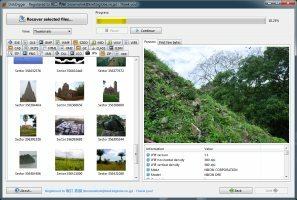 Improved support for scanning disk images. 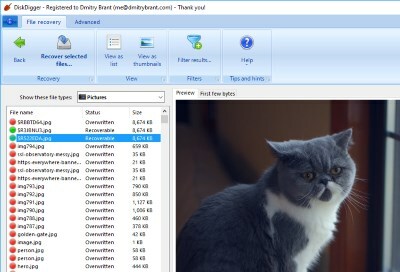 In the Advanced tab when selecting a drive, click the "Scan disk image" button. For forensic-strength scanning of disk images, you can control the number of bytes per sector (all the way down to 1), for recovering files that may not be aligned to sector boundaries. Added support for recovering raw images from Panasonic/Lumix cameras. As mentioned earlier, DiskDigger now requires .NET 4.0. 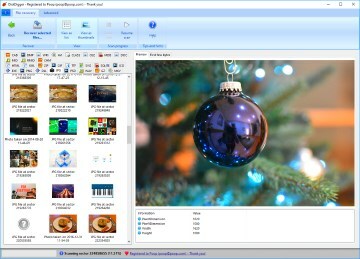 Therefore, for running it on Windows XP or Windows Vista, you may need to install .NET 4.0 from Microsoft if you don't have it installed on your system. 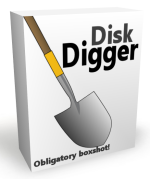 Download DiskDigger now, and start recovering your files!